Exactly 100 years ago today, a notice appeared in the Adelaide Register about arrangements for the first ‘Anzac Day’, which was to be held on 13 October 1915. This year’s Floriade spring festival in Canberra has the theme of ‘Reflection’ and the logo of a stylised poppy but, despite a round-up of ‘usual suspect’ commemorative themes, it is still basically a flower show. It is also making an effort to press a range of other buttons. Stuart Robert MP is to replace Senator Michael Ronaldson as Minister for Veterans’ Affairs. The new minister does not seem to have the additional title of Minister assisting the Prime Minister for the Centenary of Anzac though we will await the publication of the official list to confirm this. Update 7.35 pm: official list now available with divisions by portfolio; shows Mr Robert is also Minister assisting the Prime Minister for the Centenary of Anzac. Minister for the Centenary of Anzac, Senator Ronaldson, put out a media release on Vietnam War commemoration, including the notable phrase that ‘the focus [of commemoration] is moving to other conflicts’ than the Great War. The long-running 100 Stories project offers an online course (from 12 October), a public lecture from Professor Jay Winter and the launch of the book of the project (both on 11 November). Details are here. The leader of the project, Professor Bruce Scates, recently criticised the lack of sufficient funding for the digitisation of repatriation records, a key resource for this work. Cengiz Ozakinci refutes the myth that Ataturk and General Birdwood met in Istanbul in October 1918 and discussed the reasons for the British setbacks on 25 April 1915. An article in Fairfax by Honest History’s David Stephens examines the speeches of Minister Michael Ronaldson and detects a disturbing theme of the need for blood sacrifice by future generations, though the current generation has been largely spared this responsibility. Professor Bruce Scates writes about the inadequacy of financial provision for digitisation of the repatriation records from the Great War, compared with the profligacy of funding of other Anzac centenary activities. Ian McPhedran’s story picks up material from the Honest History website and includes a quote from Honest History’s David Stephens and from James Brown, author of Anzac’s Long Shadow. The Lone Pine memorial service early last month was presented as a consolation commemoration for people who did not win a ticket in the ballot for 25 April. The Department of Veterans’ Affairs expected up to 5000 people to attend. As it turned out, only about 750 turned up. Why? Various reasons have been suggested, with stress on the oppressive heat. Presumably, anyone who considered going would have checked August temperatures in the Dardanelles. Maybe they were put off. There is also a question, however, of how well the event was publicised. A travel agent of our long acquaintance has been running tours to Turkey for decades. He says he found out about the Lone Pine service from brief television coverage on the day. He said there has been no tradition of a service for Lone Pine; many local tour organisers would not have been geared up for it. ‘None of the Turkish tour operators promoted tours and I didn’t see any Australian ones though there may have been one or two promoted through military/RSL circles’, he said. There’s another possibility which we present for consideration: perhaps Lone Pine was a victim of ‘the no prizes for second place’ syndrome. Just as interest in Australia’s military history has focussed on Gallipoli to the exclusion of many other, more significant campaigns, perhaps ‘the landing’ has been disproportionately the focus, compared with other dates in the Dardanelles campaign. Lone Pine featured in the Australian War Memorial shop, as we mentioned last time. 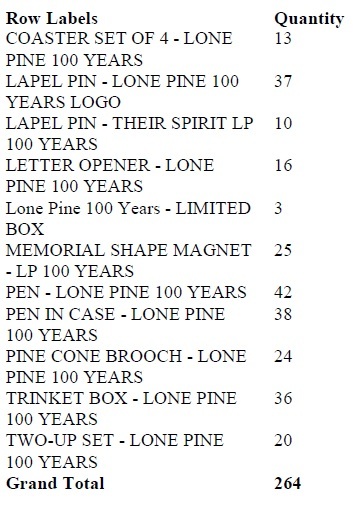 We asked for and received information about sales of Lone Pine memorabilia. This on the left came (printed here unedited). We had to ask what period these figures covered and were told they were for both shop and online for the week commencing 30 July. We thought of asking how this compared with forecast sales but communication with the Memorial has become so complicated we decided not to bother. 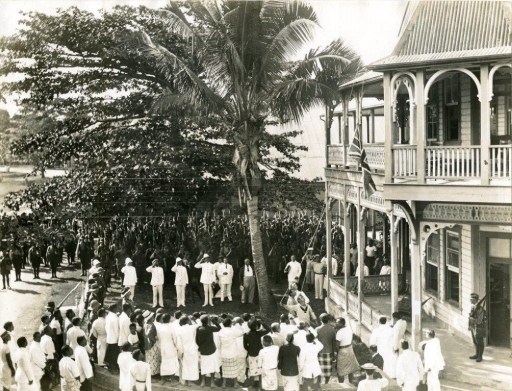 Finally, on Lone Pine, while Generals Cosgrove (Governor-General) and Campbell (Chief of Army) braved the heat and delivered thoughtful speeches, Minister Ronaldson was not present. This upset one attendee enough for him to complain to Honest History; he did say, however, that the service was moving and well-organised. We passed the complaint on to the Minister’s office but have not received the courtesy of a reply. The Minister has been busy meanwhile on matters to do with Victory in the Pacific and Vietnam, the Lone Pine centenary (more or less coinciding with the 75th anniversary of VP Day), and the 49th anniversary of Long Tan. If commemoration fatigue about World War I sets in there are still plenty of other battles to remember. Children must understand the concept of blood sacrifice. They must carry the torch of remembrance of this sacrifice. They must be prepared to defend our freedoms, as was done by those who are being remembered. Thus will be ensured the necessary blood sacrifice by future generations. This will be an appropriate reward for the current generation’s advocacy of blood sacrifice. A recent traveller south of the Murray returned with a showbag from the Anzac centenary people in Victoria. It included a glossy booklet titled Victoria’s World War One Legacy: Recipients of the Victoria Cross, which tells the stories of 26 Victorian-based VC winners from the Great War. The booklet is careful to state that these 26 are ‘not Victoria’s only wartime heroes’ and that their stories lead us towards ‘the often unsung’ stories of many others. Honest History’s president, Peter Stanley, wrote recently about our growing obsession with VC winners and suggested it was anti-egalitarian. The Victorian approach may – may – be more subtle but we’ll need to read the booklet more closely. All four living VC winners (Donaldson, Keighran, Payne, Roberts-Smith), plus the father of deceased Cameron Baird VC, took part in the Lone Pine ceremony mentioned above. The celebration of individual acts of courage lends itself well to promotions to children, as in the egregious but prize-winning DVA/AWM publication, Audacity, which includes 17 photographs of medals awarded to service people plus exercises for the classroom about the sort of activity that wins medals. For many years, the service in the military has been promoted to children and youth as a rewarding job. Now it seems to be morphing into a job where you can win medals. The fact that it is the only job which ultimately puts individuals (under orders) into the position of ‘kill or be killed’ seems to have been glossed over. Last year, Australia heard more about the Battle of Bita Paka in the former German New Guinea. At about the same time that a small Australian force neutralised the Germans, a small New Zealand force was doing the business in the then German Samoa, away to the East of New Guinea. The Auckland War Memorial Museum has gifted to the Museum of Samoa a display showing aspects of the New Zealand wartime occupation of Samoa. A large part of the exhibition will be in the Samoan language. ‹ Stephens, David: Freedom and the Australian War Memorial: is Honest History not a force for good?